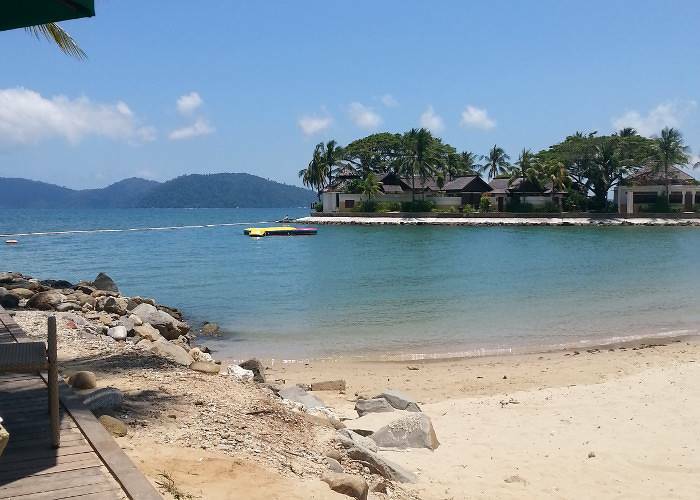 Recently, I was lucky enough to travel to the Shangri-La Tanjung Aru Resort & Spa in Borneo with my family. On the outskirts of Kota Kinabalu, this gorgeous hotel marries island paradise with the modernity of life in the capital. Coincidentally, this very hotel is featured in this week’s Real Deals! The deal itself is an absolute steal, from just £799 per person down from £1,384 for a luxury seven-night stay in this five-star resort. What’s more, there are no hidden extras. This price includes return flights, hold luggage allowance and return transfers. All of which, if you ask me, is pretty hard to say no to! Click here to find out more. For my trip, after two fairly long flights (16 hours in total) it is fair to say that my sister and I were a little jetlagged! To arrive to anything less than absolute tranquillity may have snapped our already fragile moods – however, the transfer between the airport and the hotel is very short at less than half an hour (thank goodness!). From arrival until departure our stay was incredibly peaceful. The hotel is very open-plan, with large sitting areas in between corridors overlooking lush gardens, or incredible sea views. The first time I saw the sunset on this holiday, it wasn’t the sky that I first noticed, it was the sea of people congregating at the beach bar which juts out into the sea. The vibe is distinctly festival-like at this time of day; everyone gathers and has drinks and food with music playing in the background whilst they watch the sinking sun. At first, I felt like this might be a little over the top but having witnessed the sunsets myself, I can say that this teeming excitement is totally founded! Alongside amazing rooms and an absolutely incredible setting the hotel offers a number of activities for reasonable prices: whilst there I played tennis, went paddle boarding (which is actually something that even the uncoordinated like me can enjoy!) and went to the surrounding islands – all of which can be arranged at the hotel. Given that the activities take place out of the hotel you might expect a tendency to charge sky-high rates but this was certainly not the case at Tanjung Aru. 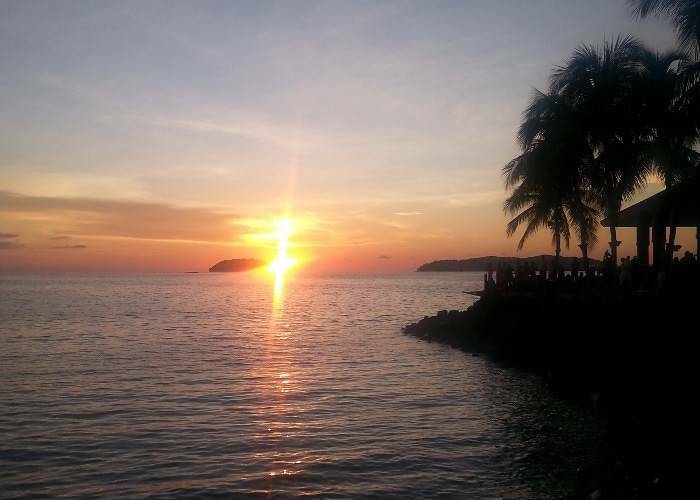 Alongside the activities that are available through the hotel, Kota Kinabalu is also very, very close at about a five-minute drive away. If you like good food at cheap prices (and who doesn’t?!) then Kota Kinabalu has no contenders. The heritage museum is definitely also worth a visit, showing an array of different exhibits including a series of photos of colonial Borneo which was fascinating. The idea of Borneo is probably most synonymous with the orangutan. These orange creatures grace the pages of all the guide books and magazines and so are an absolute must-see. For me, I wouldn’t have felt that I had seen the true Borneo if I hadn’t have seen one. 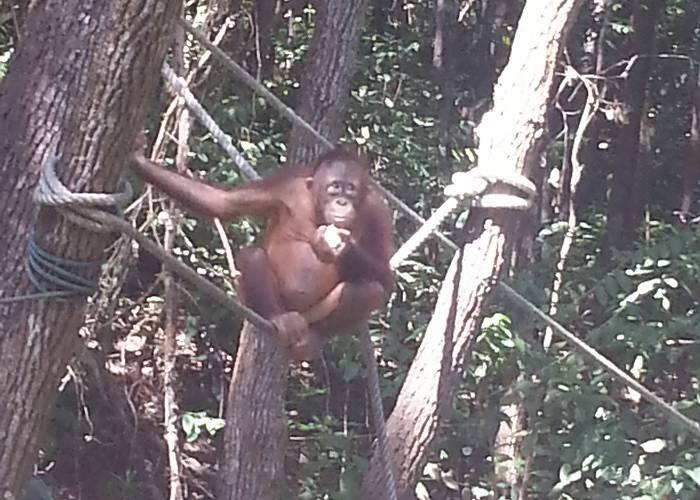 Luckily, the sister hotel (Shangri La, Rasa Ria) has its own small sanctuary for orphaned orangutans and trips are run between the two hotels daily. The absolute highlight of the trip for me was a trip out to the surrounding islands, Sapi and Manukan. 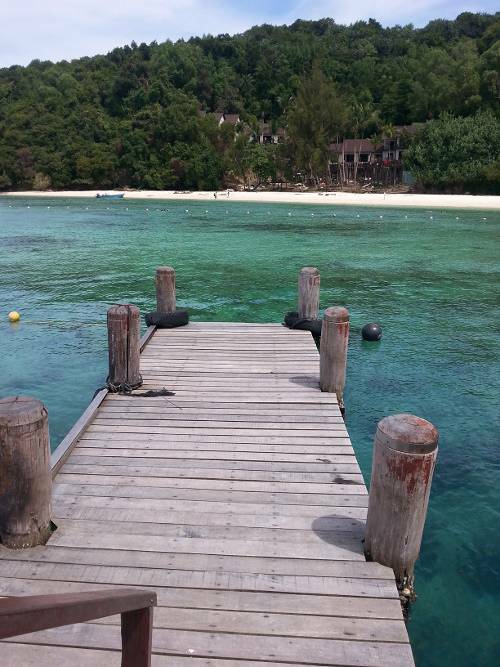 The hotel itself sports white sand beaches clad with palm trees but on Sapi the beaches cannot be contended with – white sand meets crystal clear waters in true tropical paradise form. Finding Nemo has made clown fish seem like something other-worldly, and to be enjoyed only in cartoons or aquariums but snorkelling off these little islands we could find them in abundance, amongst shoals of parrot fish and other brightly coloured fish. To be able to see so much from snorkelling alone was amazing. My Dad on the other hand was a little braver, spending a day diving and getting to swim with a turtle and a two-metre shark; something which I’m both envious and afraid of. After just one trip I’m hooked, and would absolutely love to return! To book yourself an incredible Borneo getaway, click here. ← Nano-Breaks: Maximising Your Weekend!